Our Technology practice helps clients manage the risk and cost of e-discovery. From forensic data collection to fully managed document review services we collaborate with our clients to deliver strategic solutions tailored to their unique legal requirements. With keen focus on the productivity and defensibility of document review, clients rely on our comprehensive portfolio of software and services expertise and address matters ranging from internal investigations to large-scale litigation with global e-discovery requirements. 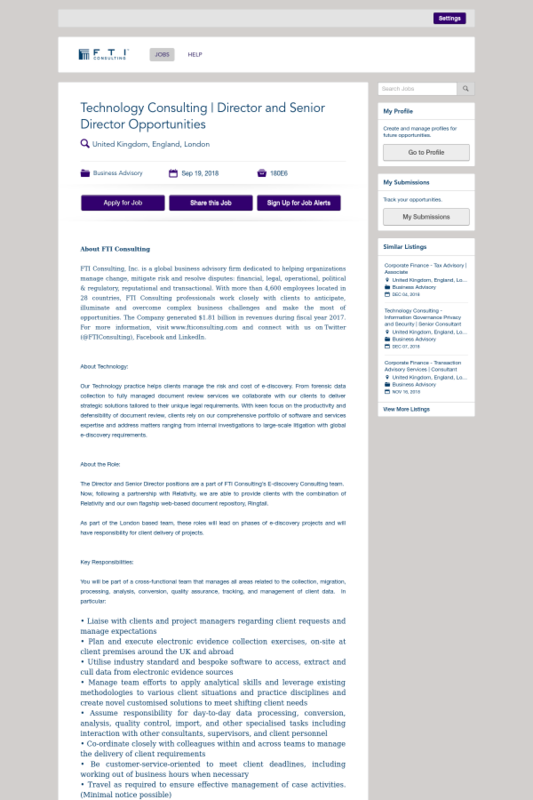 The Director and Senior Director positions are a part of FTI Consulting’s E-discovery Consulting team. Now, following a partnership with Relativity, we are able to provide clients with the combination of Relativity and our own flagship web-based document repository, Ringtail. As part of the London based team, these roles will lead on phases of e-discovery projects and will have responsibility for client delivery of projects. Confirmed 2 days ago. Posted 30+ days ago.